Quirky sues OXO for patent infringement (case settled) @quirky vs @oxo Invalidating patents from crowdsourcing ideas & posting videos? « Adafruit Industries – Makers, hackers, artists, designers and engineers! 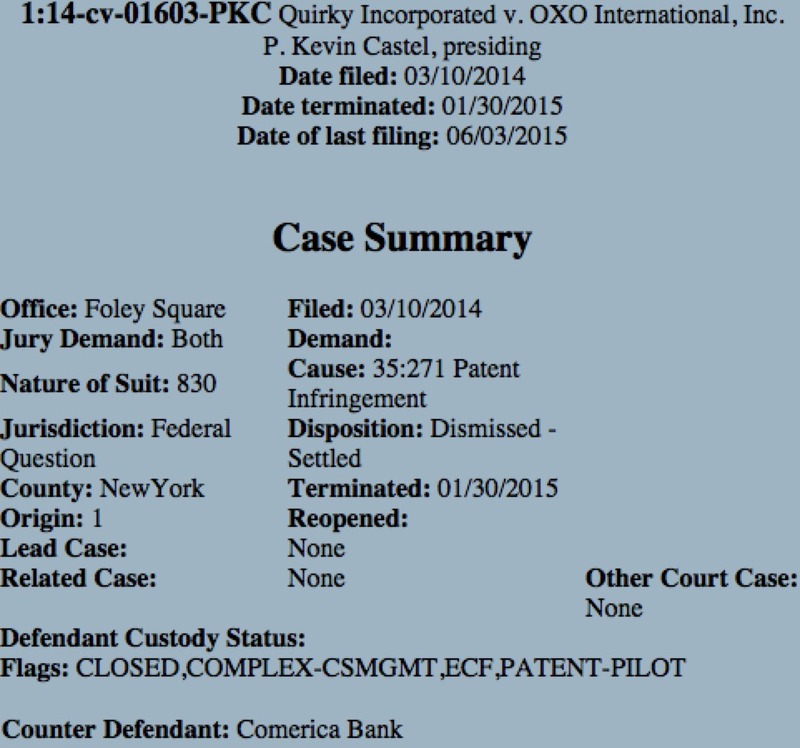 Quirky sues OXO for patent infringement (case settled) @quirky vs @oxo Invalidating patents from crowdsourcing ideas & posting videos? More Quirky news this is from last week-ish and is a follow up from our 2013 post “Quirky vs OXO“. Do you remember when Quirky did a protest “Justice for Bill Ward” about OXO (previous article here) … and OXO responded to the claims on a post? (blog post here) – That was the end of it right? Nope, Quirky filed a patent infringement for the BROOM GROOMER anyways (PDF patent 8,555,459). It’s been over 1 year and the case is over, what was the outcome? It appears OXO responded back effectively and it went to “settled” (PDF). 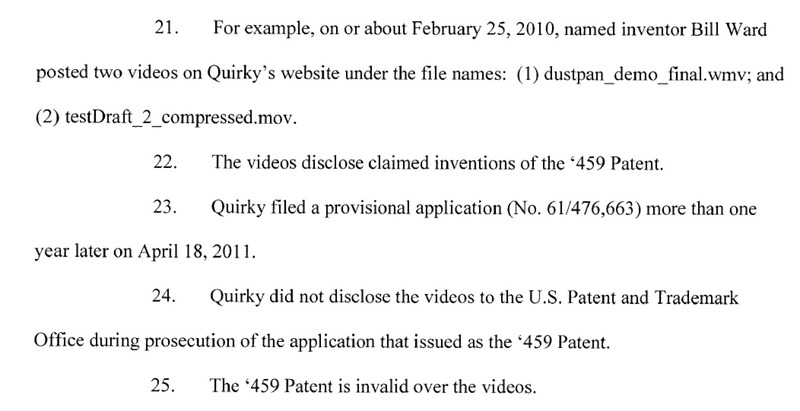 However what was said is really interesting if you’ve ever posted a video online: it appears that OXO pointed out the patent is not valid because Quirky waited too long to file after it was disclosed on video on their site, on top of that Quirky did not disclose the videos to the USPTO (later Quirky admitted that in the counter claim / counterclaim). If you have a PACER account you can view all the docs here. Unfortunately, the designer of Quirky’s Broom Groomer wasn’t the first person to come up with the idea of teeth on a dustpan. The idea was actually invented almost 100 years ago. On September 9, 1919, the patent for this idea was issued to Addison F. Kelley from Freeland Park, IN. Information about this patent (No. US1,315,310) is available here: http://www.google.com/patents/US1315310. One thing we noticed, a bank was named as a counter defendant. In the counterclaim (OXO vs Quirky, summons PDF) an entity called Comerica Bank was named a defendant, who are they? 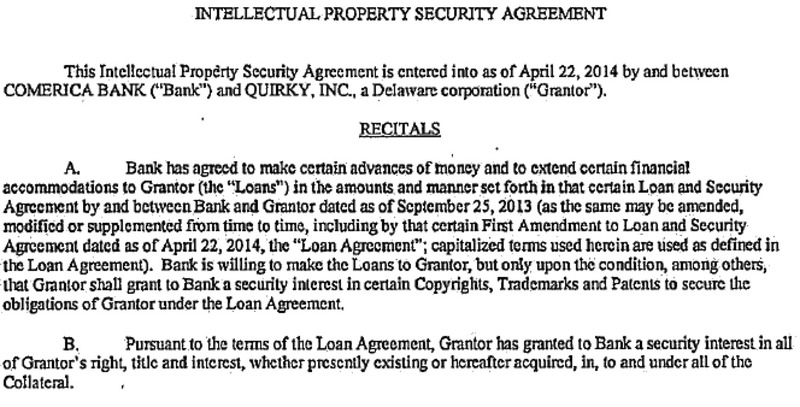 It looks like they “loan, loaned or can loan” money to Quirky in exchange for a “security interest” in certain copyrights, trademarks and patents (PDF). If we understand this correctly the bank gives or gave or can give money to Quirky based on what they think a patent may be worth. It also means that OXO could go after Quirky and the bank in lawsuit for a counterclaim since the bank may “own” the patent in some way. We did not know this was a thing, maybe this is something common now? You get a patent and then get a bank to give you a loan based on it’s potential value, sounds risky, but this is outside our expertise. We’ll ask our lawyer friends about this and update the post with any additional information. We suppose a bigger question is, did Quirky fail to file correctly and on time on a ton of patents and is the bank going to freak out about that? Any way, back to potential issue for anyone using a site like Quirky, Kickstarter, YouTube, Vimeo… or just in general – if you post videos of your “invention” and you wait more than a year to file a patent it could invalidate it later, more so if you try to sue someone and they dig up that old video. What should have the inventor/Quirky done? Or anyone else who has something they’re showing online in a video for anything? Well, if you ever want protection, you’ll need to file a “provisional patent application” which contains an informal but complete description of the invention. A provisional application secures the inventor’s place in the timeline, and also is pretty cheap to prepare (you might submit, for example, a transcript of the video, some key screenshots, and the text of the Kickstarter pitch or that Vimeo video from years ago when you first showed you product/idea to the world). We are not lawyers, this is not legal advice – it’s an observation that a lot of people are using crowdsourcing for ideas/money and more, and big venture-funded back companies like Quirky are filing patents, can get loans based on those ideas, lawsuits eventually happen… and that video back in the day where you showed off your idea may get you a lot of interest and VC later, but if you become a company later and get a patent, be careful about disclosing when and where you first showed it off – if you waited more than a year, you might have some problems later. More so if you decide to go on the offense and sue others. Quirky: pragmatic patenters or patently absurd? @ PandoDaily. Fresh funding and more departures at Quirky, the New York startup that burned through $150 million. How a quirky 28-year-old plowed through $150 million and almost destroyed his start-up. GE-Backed Quirky’s home automation product WINK gets recalled. If you’ve stuck around this long and you’re a lawyer or have corrections/additional information, please post them in the comments. LOL !!! I admit it, I admit it, but it was interesting reading. Thanks for this follow up. I found the whole thing to be quite nasty on Quirky’s part and pretty classy on OXO’s part. Sad to see that Quirky pushed it this far.